Page Builder is a WordPress plugin that lets you easily build and edit grid based pages. We made the interface as intuitive as possible, so it wont take you long to get stuck in. First, let’s take a look at the interface. 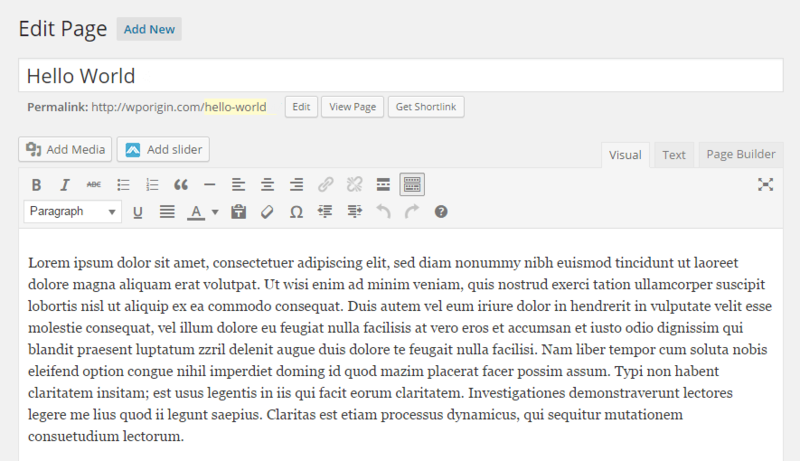 Page Builder adds an extra tab to the standard WordPress editor. Clicking on this tab brings up the Page Builder interface. You can use the toolbar to add a widget, add a new row of columns or to load prebuilt layouts. Use these buttons to delete and move a row. The up/down icon acts as a handle to pick up and drag the row up or down. Click on the Page Builder tab to start creating your content. This tab is connected to your visual editor. Now, we’re ready to start creating a page with Page Builder. Open the page you want to edit using Page Builder by navigating to Pages > All Pages and clicking the page you wish to edit. If you have not used Page Builder on this page before, it will open in the default visual editor. Click on the Page Builder tab. Confirm that you’d like to copy the existing content from the visual editor into Page Builder. Any content you create with Page Builder will overwrite the existing content for that page, so we recommend that you copy your content over. Page Builder copies all of your content to a Visual Editor widget in a single column row. This setup gives you an accurate representation of how your content looked before. Open the Visual Editor widget if you need to access this content. Page Builder works with all post types, not just standard pages. First, navigate to Settings > SiteOrigin Page Builder. Then, make sure the post type you want to use it for is selected under Post Types.